Fire is on, red wines show their characters through the ruby coloration, days are mostly grey, in some parts of the world even snows and in my home it’s time for comfort food, winter food, healthy food, warm and filling food with whatever the market offers. Today, I am presenting stuffed cabbage with tuna, chickpeas, spinach, brown rice, eggs and spices. It seems to have had a good response among my friends. This is a good recipe to get rid of leftovers, it can be done with other ingredients as well, such as ground meat, mashed potatoes, white rice, quinoa, all vegetables with cheese and no grain and so on, all depend on your fantasy. It is also low in calories. Set aside a couple of hours of your time, if you are fast in the kitchen it might take less time. I am not going to give you quantities, this is a free-form specialty, more ingredients you assemble more baking pans you will fill up. It’s all good stuff. Keep in the freezer the portions you don’t use in one dinner for those days when cooking is not on your list and still want to offer the family something delicious to eat. A large cabbage will give you a good number of large leaves to stuff. In salted water parboil all the cabbage leaves, one by one for about 3-4 minute each. The salt will prevent discoloration through the process and your leaves will stay a vivid green even after the baking. Lay them on a towel to dry. Wash the spinach in the quantity you need and sauté with garlic and olive oil. Drain the juice that forms and save it for later. Squeeze the spinach of all juices and pat dry. Boil the brown rice or cook it in rice cooker, I mixed in saffron, parsley and olive oil. If you don’t have chickpeas already cooked, the canned type is OK too, but drain the salted juice in the can and wash the chickpeas in abundant current water. Drain the can tuna from the water and crumble it with a fork. Fresh tuna is better of course. Now, in a very large bowl assemble all the ingredients: brown rice, tuna, chickpeas, spinach, 2-3 beaten eggs and some spices you like. Add a small amount of Parmigiano cheese, just for binding, season to your liking with salt and pepper. Mix well. Eliminate the hard spine of the leaf, it doesn’t bend well and set aside for a different dish later. With a spoon fill each cabbage leaf, roll and make a package. 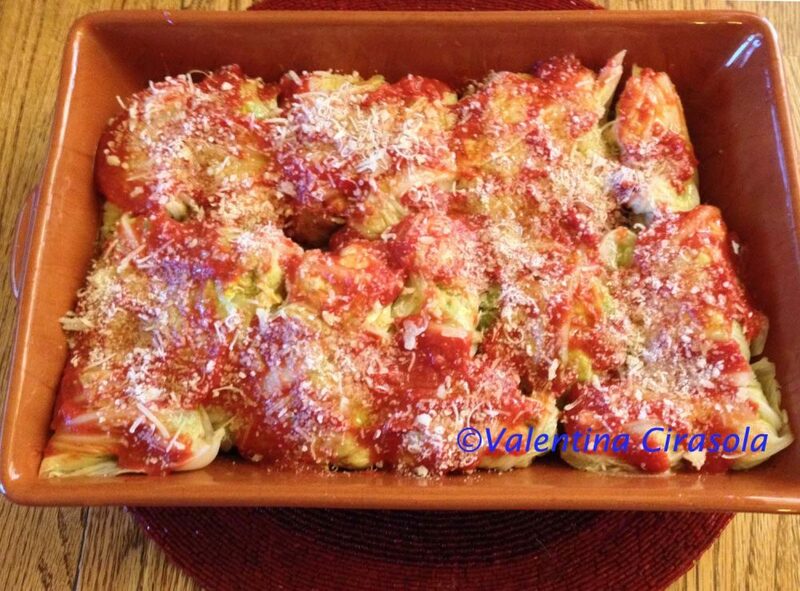 In the bottom of a baking dish put a small amount of that juice obtained from sautéing the spinach, align each package, on top add tomatoes sauce (passata) or peeled tomatoes, a swirl of olive oil and a small amount of Parmigiano cheese. Bake uncovered at 400˚ F until the top is golden brown, maybe 20 minutes, depending on your oven. Serve warm. If you have leftover stuffing, turn it into a frittata and you have another good meal assured. Buon Appetito!